This study aims to extend causal relationship between the liquidity and the profitability with growth of stock price trough out to fill a gap research by the dividend paid out as mediated variable. 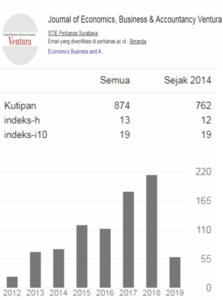 This study conducted at the banking sector listed in Indonesia stock exchange period from 2011 until 2014. The Structural Equation Modeling (SEM) by Amos Software 21.00 was used to analyze the data, and the result shows high goodness of fit while the simultaneous and individual tests generate significant result except the direct influence of liquidity toward growth of stock price. The results of this study shows that; (1) the ratio of liquidity does not affect to the growth of stock price, (2) The ratio of liquidity has positive effect and significantly to dividend paid out, (3). The profitability ratio has positive effect and significantly to the growth of stock price, (4). The ratio of profitability has positive effect and significantly to dividend paid out, (5). The dividend paid out has positive effect and significantly to growth of stock price, so we may conclude that the result evidently shows the dividend paid out was able to mediate the influence of liquidity and profitability toward growth of stock price. Augusty Ferdinand, 2006. Metode Penelitian Manajemen: Pedoman Penelitian untuk Skripsi, Tesis dan Disertasi Ilmu Manajemen. Semarang: Badan Penerbit Universitas Diponegoro. Brigham, Eugene dan Joel F. Houston. 2010. Manajemen Keuangan. Alih Bahasa: Ali Akbar Yulianto. Edisi Kedelapan. Jakarta: Erlangga. Ghozali, Imam, 2008. Model Persamaan Struktural: Konsep & Aplikasi Dengan Progra Amos 16.0. Badan Penerbit Undip, Semarang. Gordon, M. J. 1963. 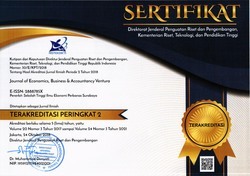 Optimal Invesment and Financing Policy. Journal of Finance,18(2): 264-272. Lintner, J. 1962. Dividends, Earnings, Leverage, Stock, Price and the Supply of Capital to Corporations.Review of Economics and Statistics, XLIV(3): 243-269. Rodgers, W. dan Choy, H.L., 2013 Do Investors Value a Firm’s Commitment to Social Actvities?